Stephanie agreed to tackle the job with me and when my new Sleep Number bed was delivered we finally got the complete look. Both of us were thrilled with our efforts especially after seeing how the look all came together. 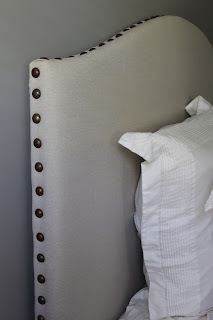 I needed a new headboard because we were up-sizing from a queen to a king size bed. With a bedroom set already, I was trying to avoid having to match wood colors on a new headboard so decided going with the upholstered look would accomplish that. While searching Pinterest for ideas for upholstered headboards, I came across this awesome drop cloth headboard by Tenth Avenue South. 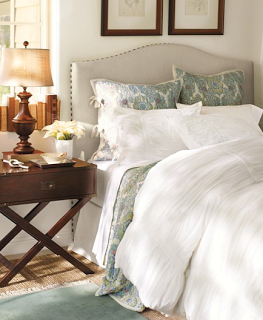 It was practically an exact copy of the Pottery Barn Raleigh headboard that sells for about $1500 for the King size, which is what I needed. 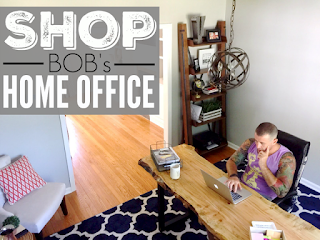 The DIY version seemed easy enough -- and as it turned out -- it was. We made the entire thing in the span of about five hours. 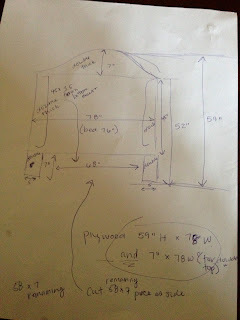 First, I drew out the dimension of the headboard on a piece of paper (click the picture to make it larger). 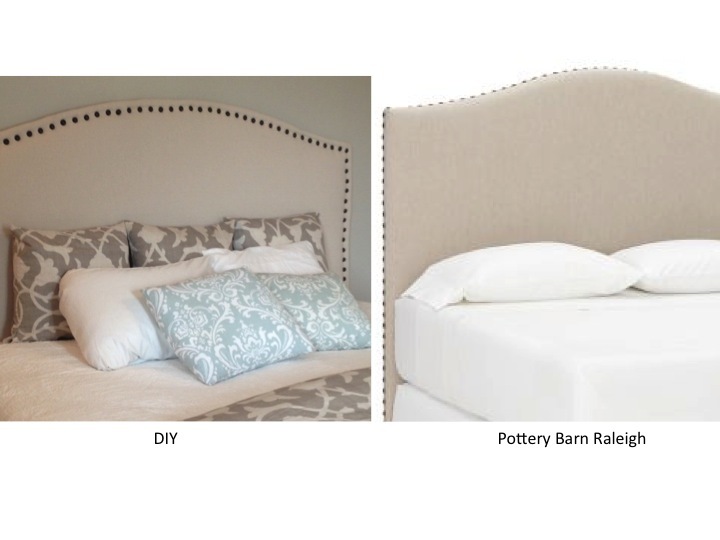 I took the size dimensions from Pottery Barn's website where they list the details of the headboard I was going after. Their king headboard was a little wider than what I wanted mine to be. My bed is 76 inches wide, so I made the headboard 78 inches to have just a small overlap. 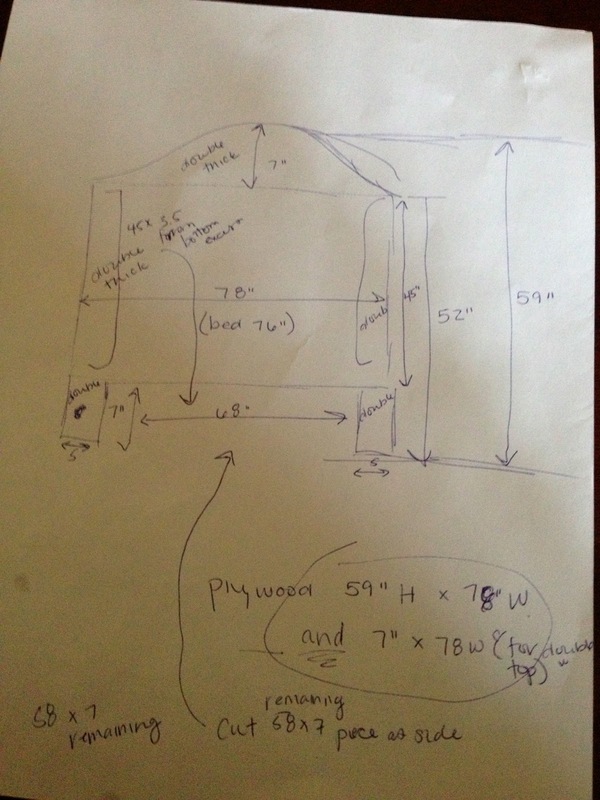 Stephanie and her husband went to the hardware store to pick up the plywood for me using the dimensions I had drawn. Home Depot and Lowes will both cut it for you to size -- but only straight lines. Unfortunately, they didn't have plywood quite tall enough (59" was the required height) so we had to get two pieces. We were easily able to nail them together using a third piece along the back to connect them. 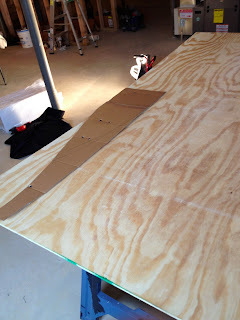 I had cut out the curve of the top of headboard on a piece of cardboard. We traced it directly on the plywood, then flipped the cardboard and did the same thing on the other half to make sure the curve was the same on both sides. We then used the jigsaw to cut the curve. Slow and steady is the key. I was a little nervous because the cut wasn't exactly on the line, but after putting the foam and batting down it hides a lot of the mistakes. 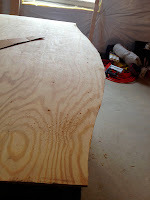 After the curve was cut out, we worked on the legs. To be honest with you, we decided later there was no real reason to have legs. 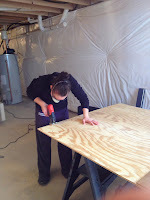 It just creates extra work to attach and/or cut them out of the plywood depending on how you do it. If you keep the bottom of the headboard straight all the way across, it actually gives it more support. Plus, you can't see the legs now that the bed is pushed up against it. This is one of the only things I would have done differently. 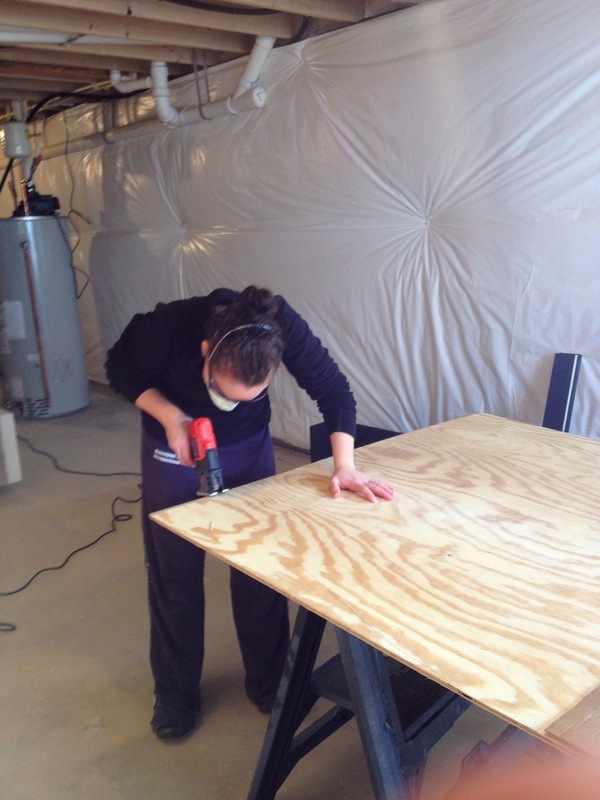 Next, we laid the plywood headboard flat and used spray adhesive to attach the foam. We laid it straight across, covering the entire curve and then later cut the foam down to shape using scissors. I had a lot of trouble finding enough 1" foam to cover this beast. 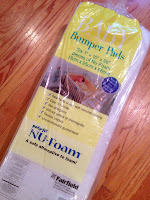 I did find two bags of foam meant for crib bumpers. Each came with six pieces and each piece was 1"x10"x26" in size. At that size I needed about 4 bags to completely cover the plywood. I actually ended up having a lot of trouble finding any more than two bags and we were up against the clock, so we went to plan B. 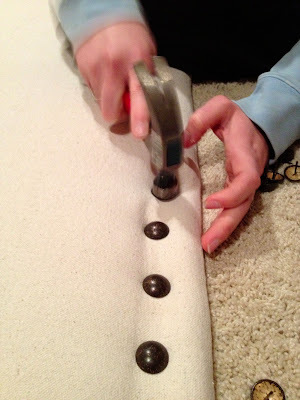 The original plan was to put foam all over the headboard and then put two layers of batting all over headboard and staple gun it around the back. But since we were short on foam, we had to improvise. I decided I would put on as much foam as I had and then I would fold over the batting to be double thick in the bottom area where I did not have any foam. I only put a single layer of batting over the foam area. Thanks to my brother in law's extensive power tool collection we were able to put the batting on in a matter of minutes using an air compressor and staple gun. A regular staple gun would have worked fine, just make sure to put a lot of pressure on it. cloth. I bought a 9' by 12' canvas drop cloth found in the paint aisle at Home Depot. I washed, dried and ironed it before we laid it out to cover headboard. The drop cloth had a huge seam running through the middle which I was nervous about. However, even the king size headboard only required half of the drop cloth so the seam didn't end up being an issue at all. I actually cut the drop cloth in half right at the seam and plan to use the other half to make a matching upholstered bench for the end of the bed. With the drop cloth laid out on the floor and the headboard centered on top, I pulled it tight as Stephanie used the staple gun to attach it. We started at the top middle and worked our way around each size, pulling it taunt as we went. Around the legs I folded the material neatly -- this is where the air compressor really came in handy -- because going through a few layers of fabric, batting and wood was a little tough. showcase it more so I put it on the front and I'm so glad I did. It's hard to tell from the photos but the upholstery nails I used are pretty big -- unlike the upholstery nail head kits you can buy which are much smaller and less expensive. 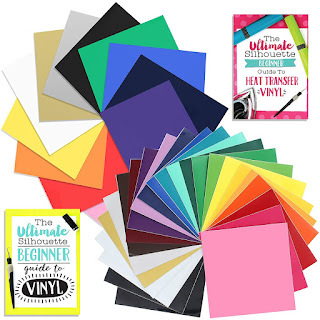 The exact nails I used can be found here. While this was the most expensive and frustrating part of the process for me -- it was also the most rewarding. I put the first nail head in and then kind of eyeballed where I wanted the second to go. Then I used that distance, which was about 1.25", for the rest of them. I had about two dozen duds, where the point of the nail would actually bend or break -- but otherwise it was just a matter or getting the nail to go into the wood and stay there. This is where I'm glad we only did one layer of batting over the foam, because otherwise it may have been too thick for the nails to go through all of that material. Now that the bed has arrived I can finally show off all our hard work! The biggest compliment I got was from the Sleep Number delivery man who asked me if the headboard was one of "theirs"
-- as he wondered aloud why they were shipped separately. When I told him I made it, his mouth dropped and he barely believed me until I showed him the leftover drop cloth. And I quote he said: "You just saved like $1500 -- I bet your husband is thrilled, girl. It looks exactly like ours." I love our new drop cloth upholstered headboard and I am so happy we decided to take on this DIY challenge because the finished product is just what I was looking for at a fraction of the price! For those wondering, yes, I made the throw pillows to match the comforter. 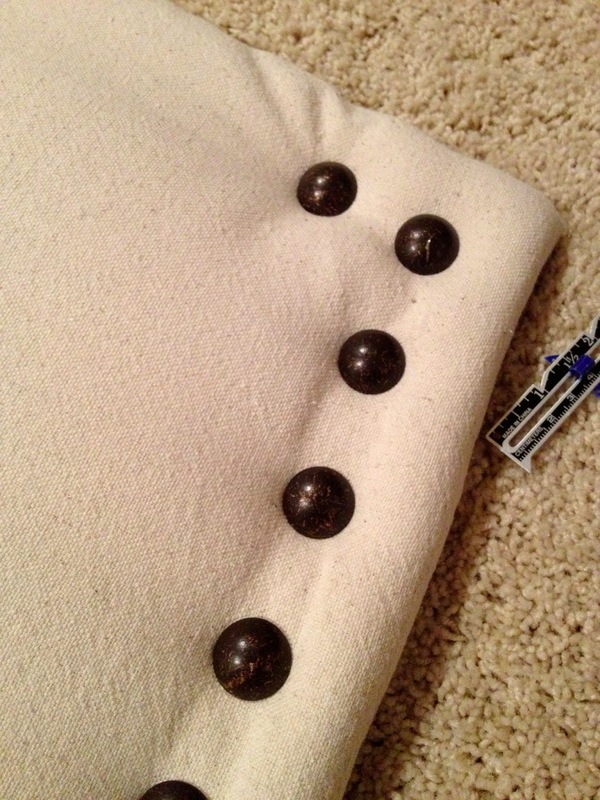 Here's the tutorial for how to make throw pillows in five minutes. No, seriously! 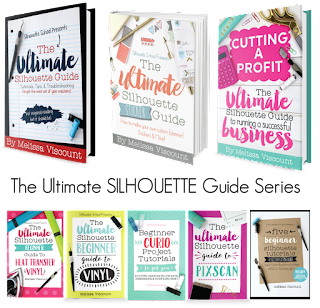 Keep Up with us, the Two It Yourselfers, on Facebook and Pinterest! I totally agree! My husband was all ready to shell out $1500 for this thing when I told him I insisted on giving it a try myself first. We both love it - and the price! Thank you Susan! Can't wait to see what you put together for Hometalk. Please send us the link as we'd love to see and share it! Sure @Jamie I will do it today! I am very new to link parties so I'm still trying to figure them all out and find daily parties to link to. Thanks for the suggestion! I can't wait to check out your blog. This looks awesome! I love how clean the look is and that you guys tackled it by yourselves! Great job!